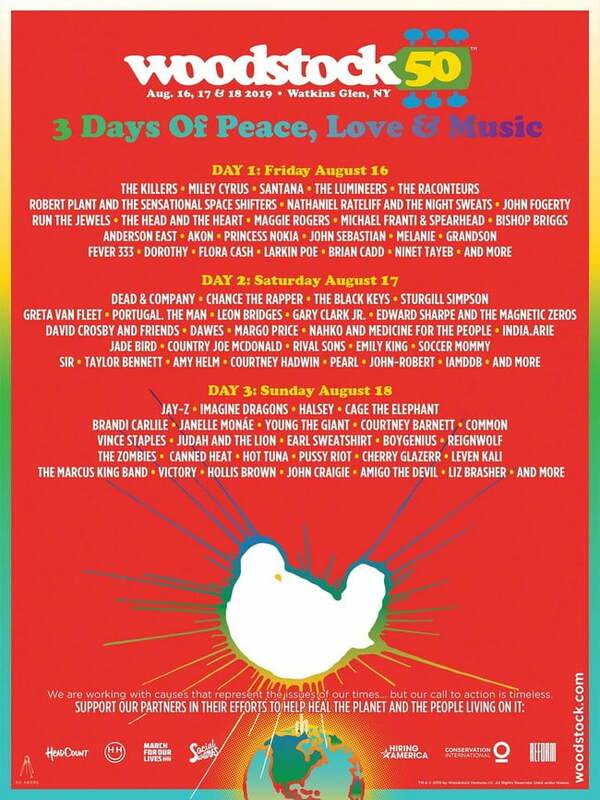 Woodstock 50 Music and Arts Fair announced the official lineup of its three-day 50th anniversary celebration today, with more than 80 musical acts. Taking place on its 50th anniversary weekend, Aug. 16-18, in Watkins Glen, N.Y. The most iconic music festival in American history is bringing peace, love and music back for a new generation of fans. Woodstock 50’s lineup reflects its mission –uniting people in a shared experience with great artists and encouraging active support of equality, inclusion and a shared sustainable future. Scheduled on Aug. 16, Friday: The Killers, Miley Cyrus, The Lumineers, The Raconteurs, Nathaniel Rateliff and The Night Sweats, Run The Jewels, The Head and The Heart, Maggie Rogers, Michael Franti & Spearhead, Bishop Briggs, Anderson East, Akon, Princess Nokia, Grandson, Fever 333, Larkin Poe, Dorothy, Flora Cash, Brian Cadd, Ninet Tayeband more. Conservation International has been protecting nature for 30 years. Today it continues its work to build a healthier more prosperous and productive planet through science, policy and partnerships with countries, communities and companies. Dolphin Project is dedicated to the welfare and protection of dolphins worldwide, and aims to educate the public about captivity, and where feasible, retire and/or release captive dolphins. Felix Organization provides inspiring opportunities and new experiences to enrich the lives of children who are growing up in the foster care system. Happy Hippie Foundation rallies young people to find injustice facing homeless youth, LGBTQ youth and other vulnerable populations. HeadCount is a non-partisan organization that works with musicians to promote participation in democracy by staging voter registration drives at concerts. Hiring America is dedicated to helping veterans find jobs – providing valuable information to help ease the transition for veterans entering the civilian workforce. March For Our Lives was started by students from Marjory Stoneman Douglas High School in Parkland, Fla., with a mission to end gun violence. REFORM Alliance exists to dramatically reduce the number of people who are unjustly under the control of the criminal justice system. Seva Foundation is a global eye care organization that transforms lives and strengthens communities by restoring sight and preventing blindness. SocialWorks aims to empower youth through the arts, education, and civic engagement while fostering leadership, accessibility, and positivity within Chicago. Lang shared that the festival will also include highly curated neighborhoods that celebrate unique experiences in all the arts – including emerging talent, specialty food offerings, workshops and crafts – as well as a dedicated “Kidstock” area. Tickets to this once-in-a-lifetime event will go on sale on Earth Day, April 22.